Vietnam Dec 23, 2013, 182 children now drinking safe water! This is Dec 22, 2013 and thanks to “Jordyn’s Journey” 182 precious 4 and 5 year old children can now enjoy safe, clean drinking water each day. This is a school and orphanage that gets their water from a nearby well, that they know is contaminated. Some days they have the money to purchase large bottles of water for the children, but they explained to us, that even this water causes a lot of the children to become very sick. The ladies that take care of these precious little ones were so excited to receive the water filters and we felt so honored to be able to provide them. 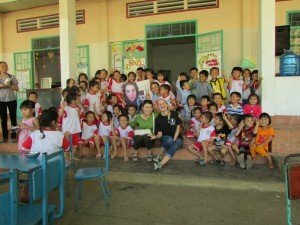 The loving, caring people that donate to “Jordyn’s Journey” make it possible to save vulnerable children in the world from sickness and some from certain death due to drinking contaminated water….We are very thankful from the bottom of our hearts to each of you for your decision to help!